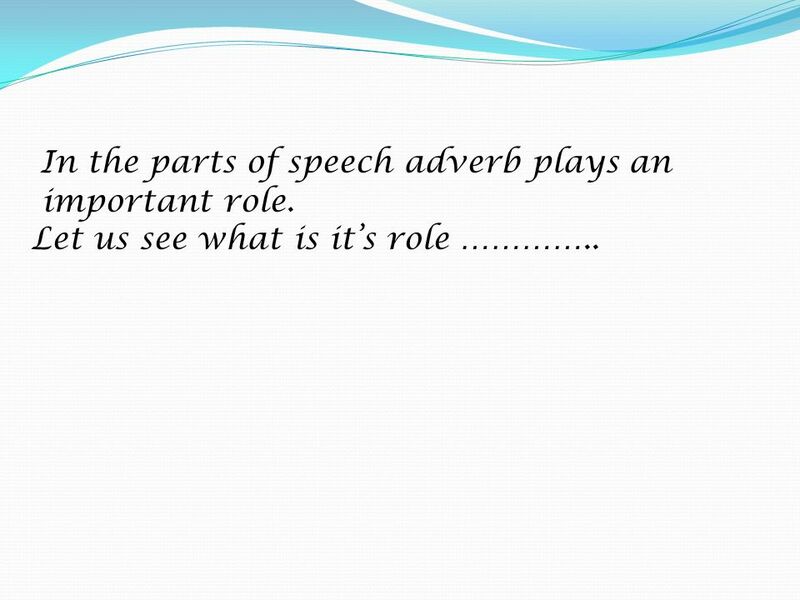 In the parts of speech adverb plays an important role Let us see what is it’s role …………..
3 Adverb:- Basically, most adverbs tell you how, where or when some thing is done. In other words, they describe the manner, place or time of an action. 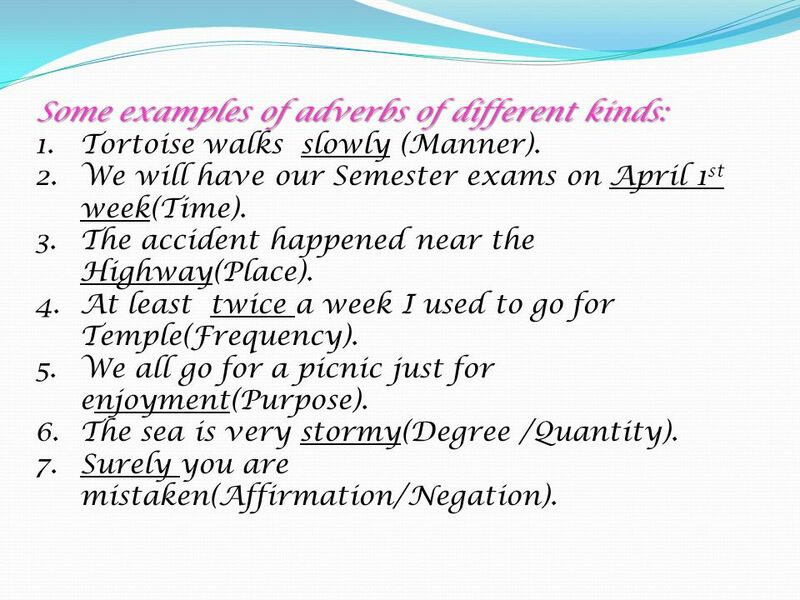 4 Commonly adverbs are formed from adjectives. Some are below. It describes in which manner an action is done. It describes where an action is done. It describes when an action is done. It shows how many times an action is done. It describes the purpose or reason for the action. 8 The boys are playing upstairs. The dog is in the garden. 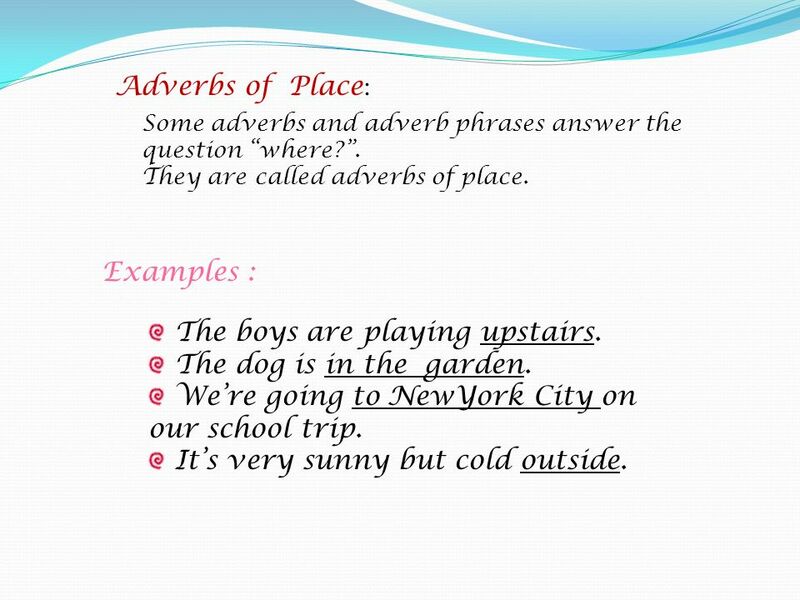 Adverbs of Place: Some adverbs and adverb phrases answer the question “where?”. 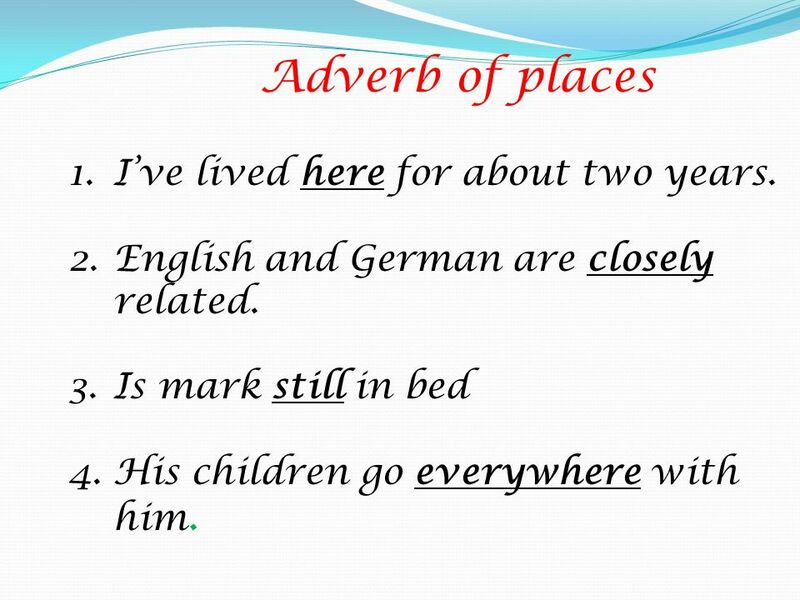 They are called adverbs of place. Examples : The boys are playing upstairs. The dog is in the garden. We’re going to NewYork City on our school trip. It’s very sunny but cold outside. 9 Adverb of places I’ve lived here for about two years. English and German are closely related. Is mark still in bed His children go everywhere with him. 10 The girls answered all the questions correctly. 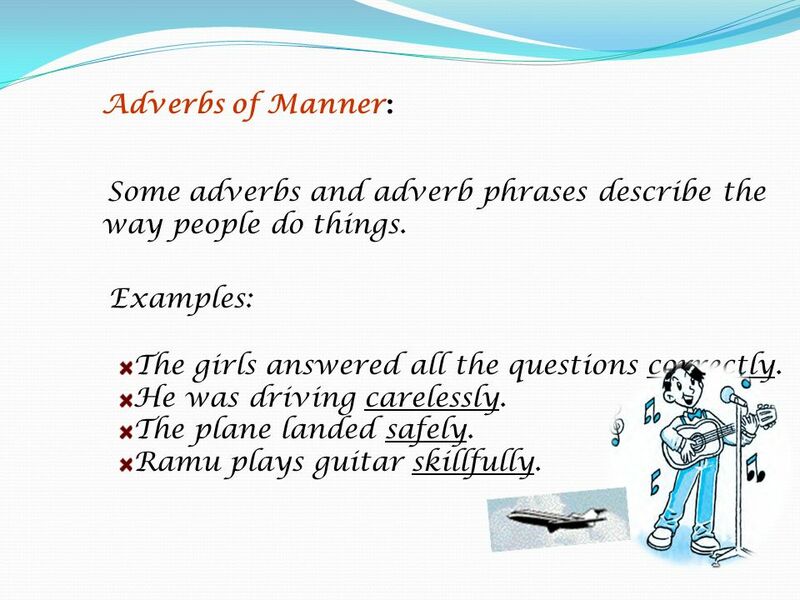 Adverbs of Manner: Some adverbs and adverb phrases describe the way people do things. Examples: The girls answered all the questions correctly. He was driving carelessly. The plane landed safely. Ramu plays guitar skillfully. 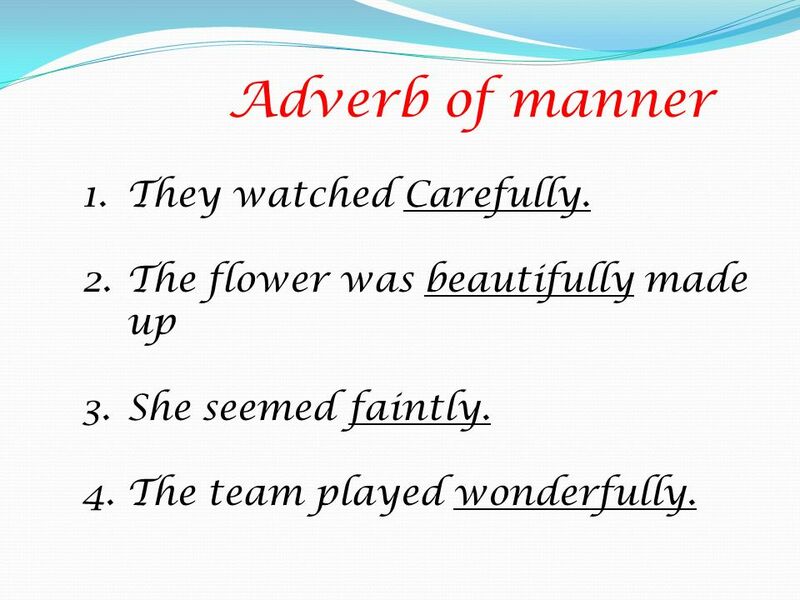 11 Adverb of manner They watched Carefully. The flower was beautifully made up She seemed faintly. The team played wonderfully. 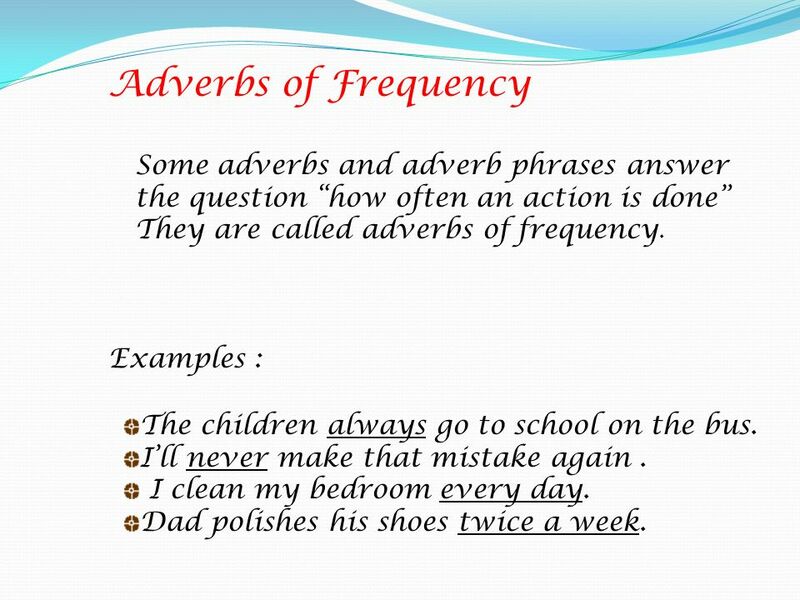 12 Adverbs of Frequency Some adverbs and adverb phrases answer the question “how often an action is done” They are called adverbs of frequency. Examples : The children always go to school on the bus. I’ll never make that mistake again . I clean my bedroom every day. Dad polishes his shoes twice a week. 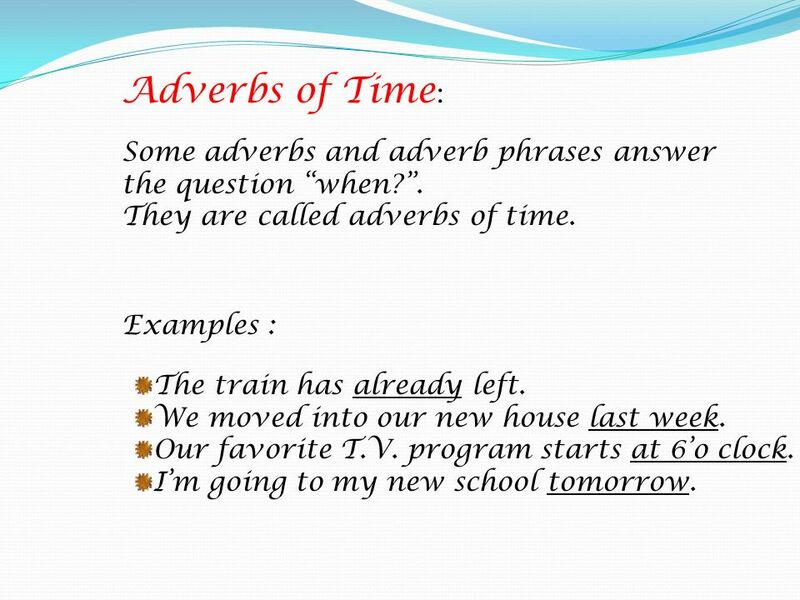 13 Adverbs of Time: Some adverbs and adverb phrases answer the question “when?”. 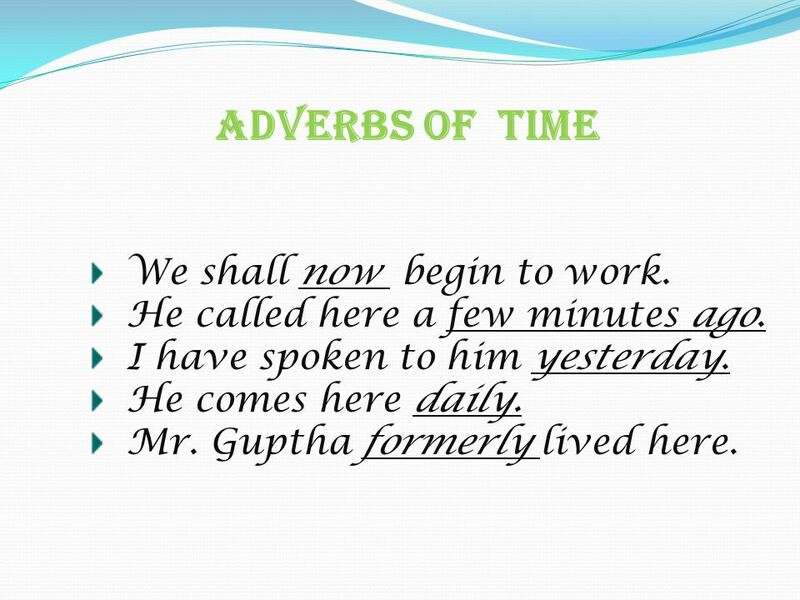 They are called adverbs of time. Examples : The train has already left. We moved into our new house last week. Our favorite T.V. program starts at 6’o clock. I’m going to my new school tomorrow. 14 Adverbs Of Time We shall now begin to work. He called here a few minutes ago. I have spoken to him yesterday. He comes here daily. Mr. Guptha formerly lived here. It shows how much, or in what degree or to what extent. He was too careless. The sea is very stormy. I am rather busy. I am fully prepared. These mangos are almost ripe. 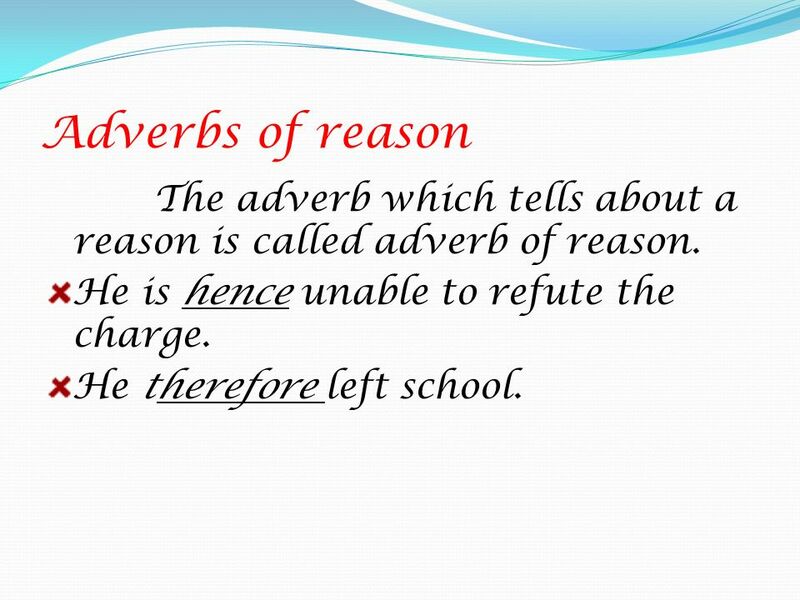 16 Adverbs of reason The adverb which tells about a reason is called adverb of reason. He is hence unable to refute the charge. He therefore left school. 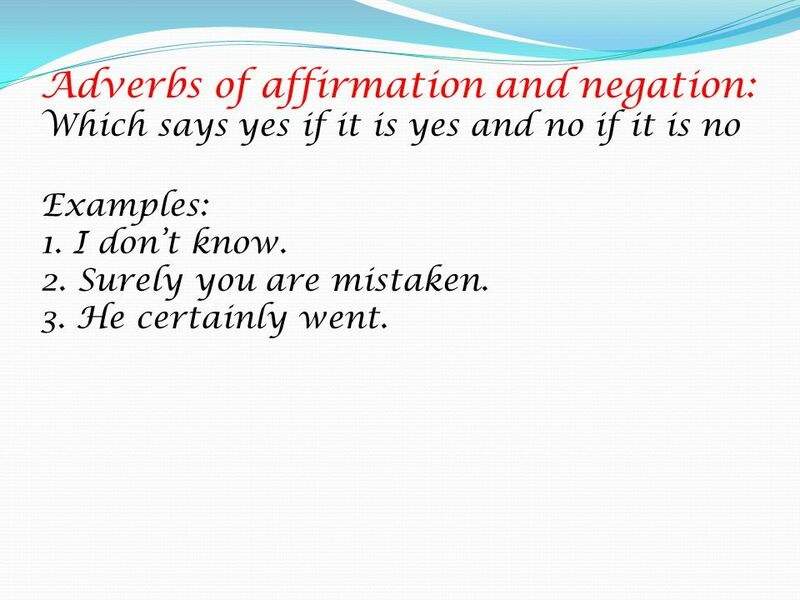 17 Adverbs of affirmation and negation: Which says yes if it is yes and no if it is no Examples: 1. I don’t know. 2. Surely you are mistaken. 3. He certainly went. 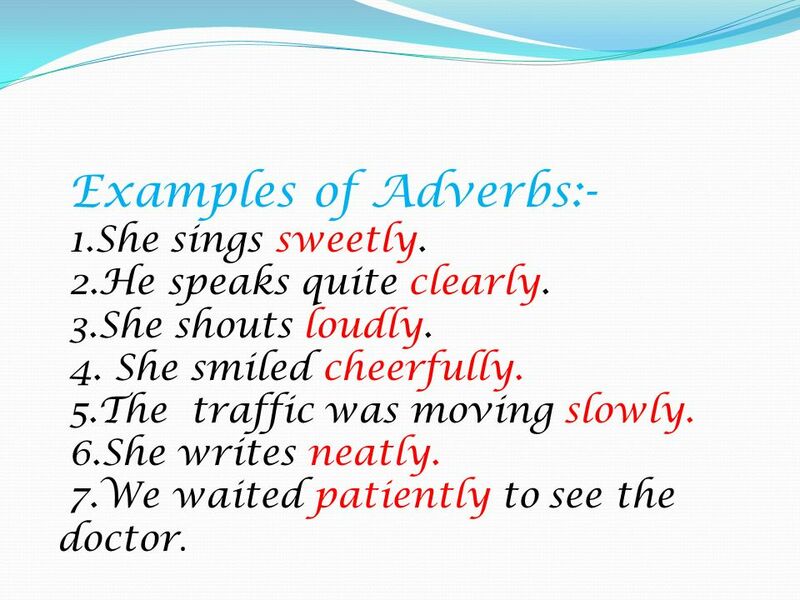 Examples of Adverbs: She sings sweetly. 2.He speaks quite clearly. 3.She shouts loudly. 4. She smiled cheerfully. 5.The traffic was moving slowly. 6.She writes neatly. 7.We waited patiently to see the doctor. Tortoise walks slowly (Manner). We will have our Semester exams on April 1st week(Time). The accident happened near the Highway(Place). At least twice a week I used to go for Temple(Frequency). We all go for a picnic just for enjoyment(Purpose). The sea is very stormy(Degree /Quantity). Surely you are mistaken(Affirmation/Negation). 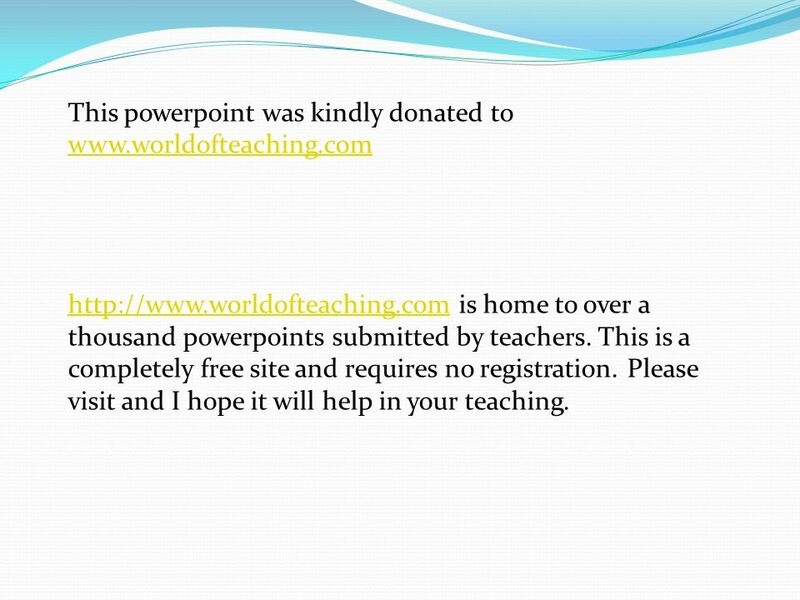 is home to over a thousand powerpoints submitted by teachers. This is a completely free site and requires no registration. 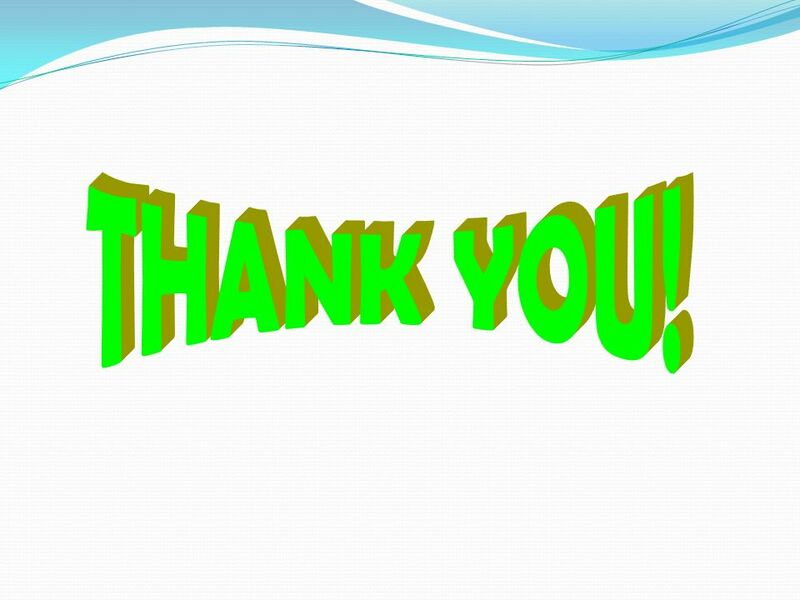 Please visit and I hope it will help in your teaching. 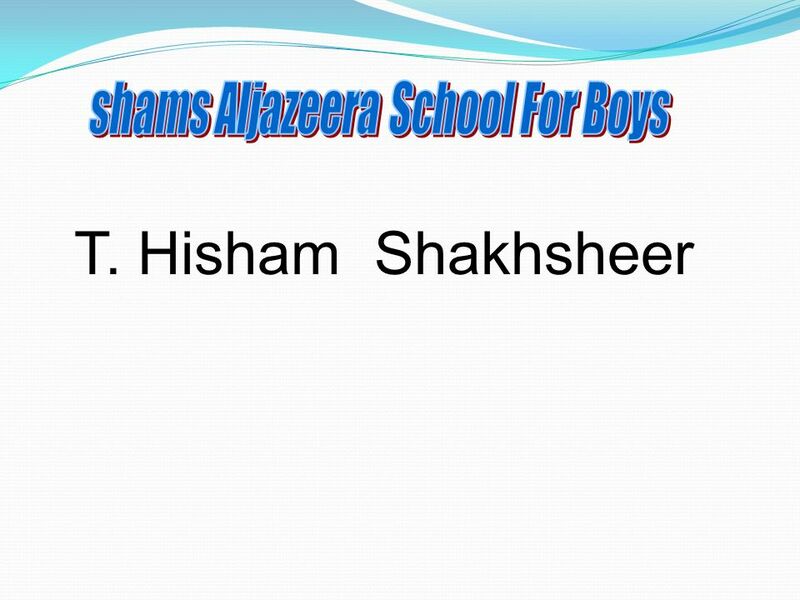 Download ppt "shams Aljazeera School For Boys"
What is this stuff? Shakespeare’s Quotable Quotes from Romeo and Juliet By Tricia Cooney. Unit 6 Cities of the World Lesson 21. New words phone call sb. TEACHING GRAMMAR Bui Thi Thao Truong Thuy Duong. Unit 2Revision. Task I Our family went to Shanghai at the Spring Festival. It was a guided ____. We went there for ___________. We enjoyed ourselves a. Laws of Exponents Whenever we have variables which contain exponents and have equal bases, we can do certain mathematical operations to them. Those operations. Jaime García Hospital Juan Francisco Mascareñas González 1Bach D Teacher: Miss Pérez. 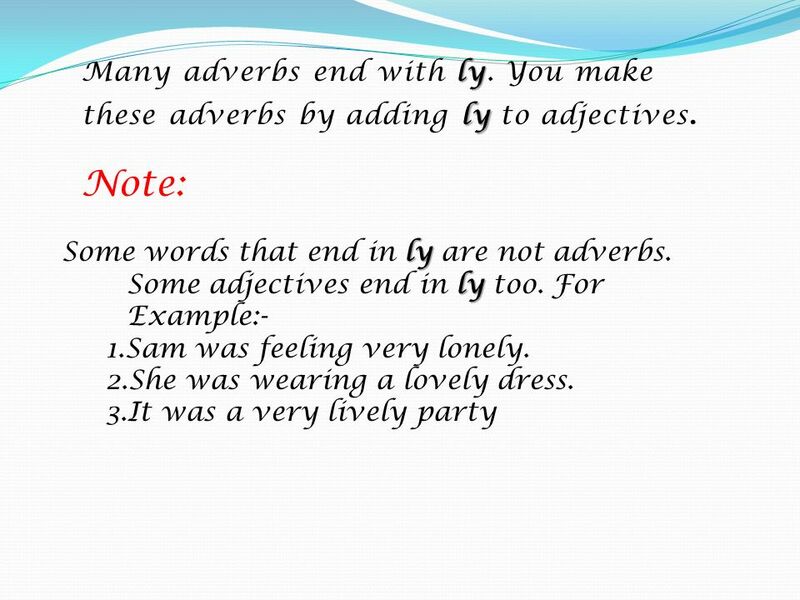 Understanding Modifiers This Powerpoint is hosted on Please visit for 100’s more free powerpoints. 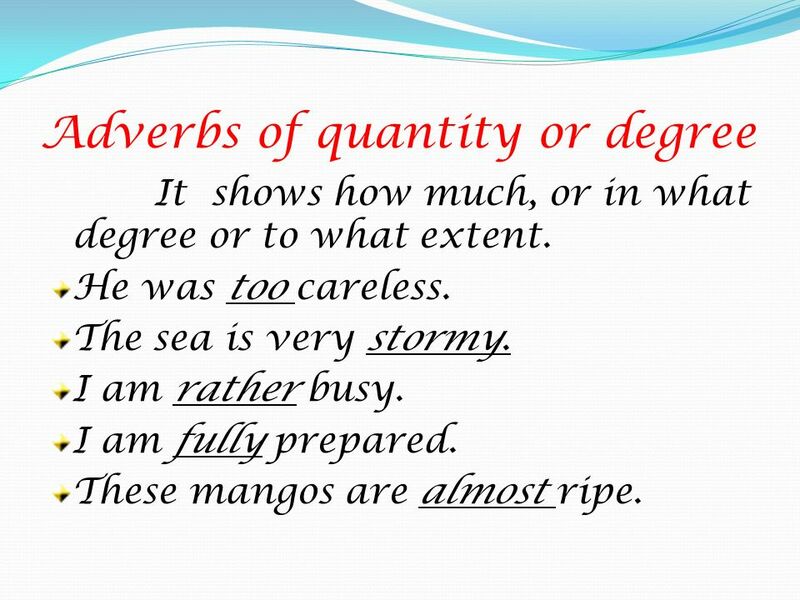 YOU WILL LEARN ABOUT o THE DEFINITION OF ADVERBS o TYPES OF ADVERBS o COMPARISON OF ADVERBS o ORDER OF ADVERBS. 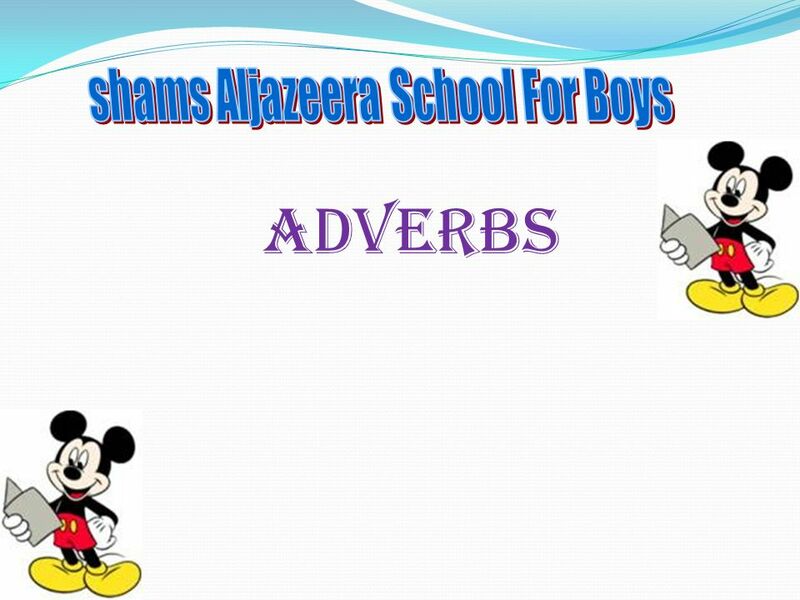 Adverbs Words which are used to modify verbs or adjectives are usually referred to as adverbs. 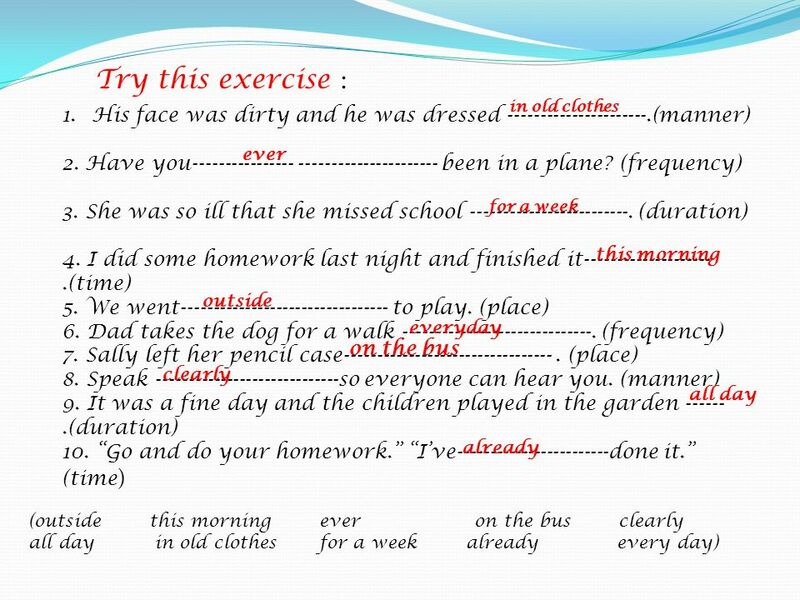 For instance, the adverbs in the following sentences are. 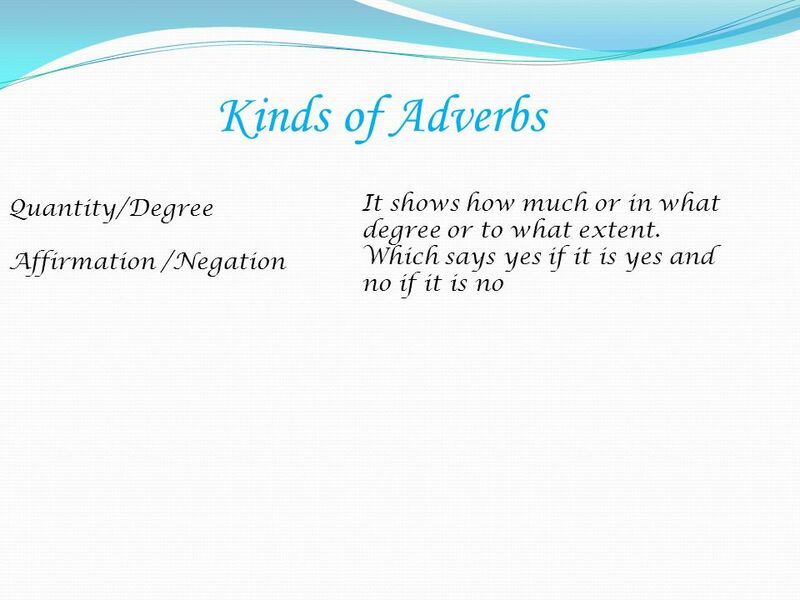 KINDS OF ADVERBS 4 Verb Modifiers. 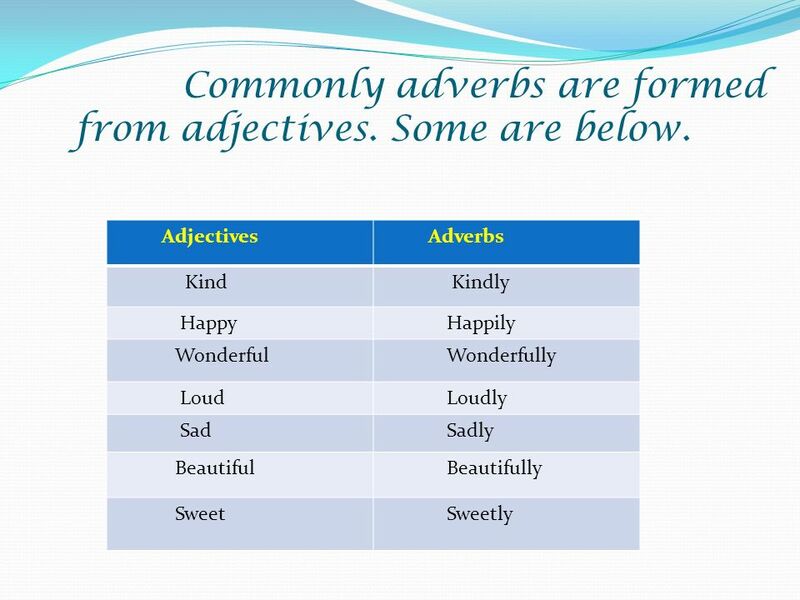 ADJECTIVES & ADVERBS RULES TO FOLLOW ADJECTIVES Modifies Nouns Modifies Pronouns. BY UZMA MINHAJ WHAT ARE ACTION PLANS? ACTION PLANS HELP TEACHERS MAKE SIGNIFICANT CHANGES IN THEIR INSTRUCTION BY ASKING THEM TO IDENTIFY THE CHANGES. 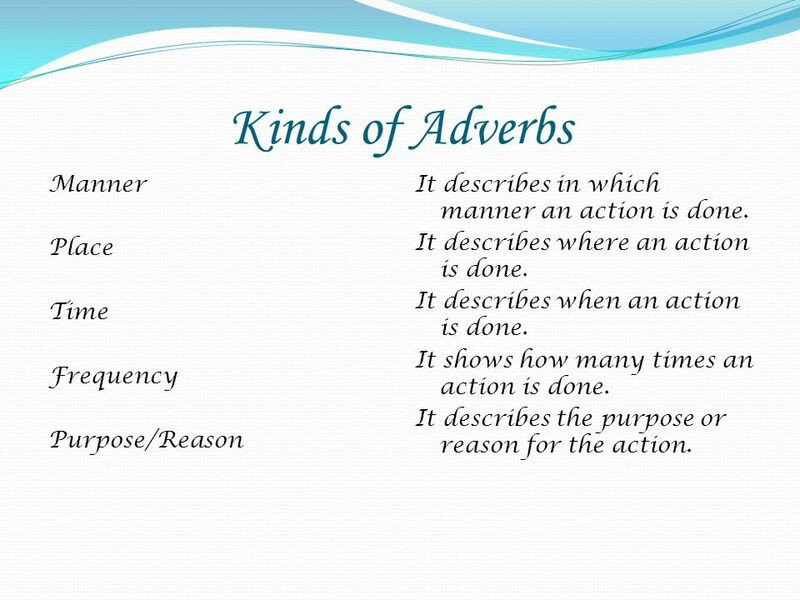 Adverbs. 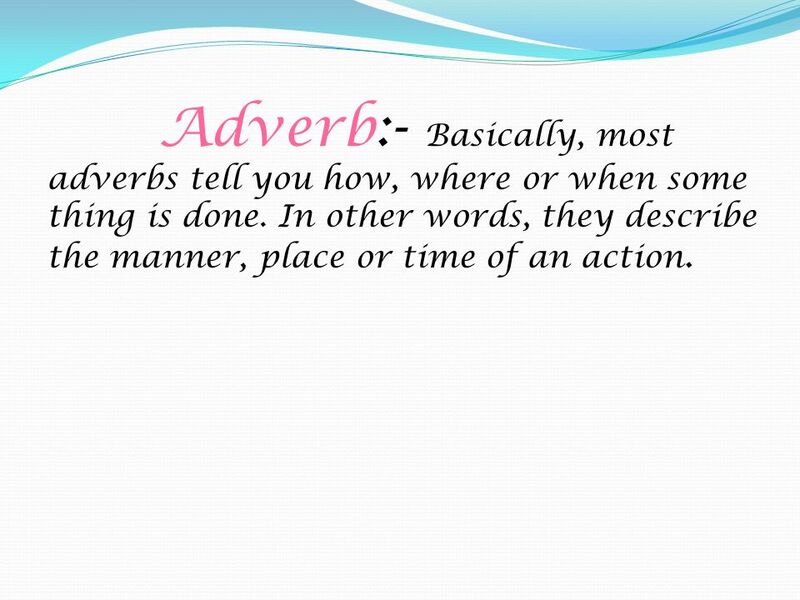 What is an Adverb? Is a word that answers questions about a verb, an adjective, or another adverb.